I love our vacations in Mexico and on Cape Cod. I had a great time when we visited Virginia a few years ago and I enjoy going to New Hampshire for the occasional weekend. I mean, honestly, any vacation is a good thing. Sometimes, though, vacation days aren’t about taking trips, they are about staying home. We call those staycations and I’m having a staycation this week. As you’ve probably figured out by now, this week’s Ten On Tuesday topic is 10 Favorite Things To Do On A Summer Staycation. Go to the beach. As much a possible. Or, in my case, as my as my non-beach-loving husband will tolerate. Read. This can be done in combination with #1, of course. It can be done anywhere, though, and that’s what makes it such a great way to spend time. Hang out at home. Last week we wrote about the things we love about our homes. A staycation is a great time to enjoy being at home. Cook something wonderful. It doesn’t have to be elaborate but when I’ve got the time I love to plan and execute a great meal for Dale and I. Swing in the hammock. Take a nap. Revel in having no place to do and nothing to do. Play games. 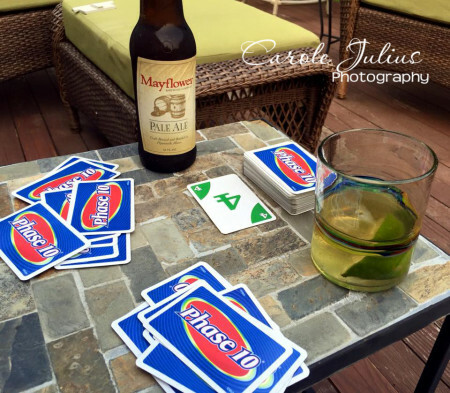 We love Phase 10, Quiddler, and good old fashioned rummy. Watch TV. We’ll be catching up with Orange is the New Black and House of Cards this week. Go to the movies. Jurassic World is in the plans. Take day trips to local attractions. Museums, historic places, parks and more. Some of the best places to visit are probably right in your backyard and you overlook them. Hullo, Plimouth Plantation. Tackle a project. Got a closet that needs to be cleaned out? A garden bed that needs weeding? Pictures you still haven’t processed? Get something like that done and you will have a great sense of accomplishment and still have plenty of time for something fun. I bet you all have great ideas for staycations and I’m looking forward to reading them and maybe even doing some of them, too. If you wrote a post for today please leave a link to your blog so we can all come and read it. Click here to sign up for the weekly Ten On Tuesday email. Staycation is a good time to do a little more in my morning exercise routine without rushing to shower, etc. I also give myself permission to sleep in a day or two if my body feels like it needs it. You’ve captured the gentle, “take your time” feeling of a staycation perfectly! If you are bing watching try Grace and Frankie on Netflix. So great! And such a good week! Enjoy Carole and Dale! Jurassic World was pretty good. I hear it’s fantastic at the IMAX theater with the special effects. Enjoy your week! It looks like you should be having some good weather too. You are so right about sometimes overlooking the attractions in your own back yard. My in laws came to visit one year and went on the cog railway line up Pike’s Peak. We, wo live right here, had never done that….at least until mom Morgan sent us a check and told us what to spend it on! Love the Staycation–do you outlaw chores during these times? Jurassic World is entertaining. You will no doubt wonder, as did we, how the central woman managed to run through the jungle and everywhere else in her high heels. In her favor, she has a “real” woman’s body – shoulders, hips, tummy, muffin-top. But nothing can match the wonder of the original Jurassic Park. It’s fun to read how others are spending their summer and to stop and take a look at oneself. Thx for the idea. Enjoy your stay cation! If you’re looking for a movie, I saw Love & Mercy this weekend and LOVED it. Dale will enjoy the music too! My in laws enjoy Phase 10 and Quiddler-those are games that are definitely played when we vacation with them. Love staycations for all the reasons you listed. I love staycations–and the ability to pick and choose what I want to do at any given time. this topic got me thinking about taking a one-day staycation…someday soon I hope! and for sure I hope it includes a nap (maybe after my lunch out with wine and dessert ;-), but I doubt it will include a “project”. hope you’re having a ball! I just started a new job, so no stay-cations for me for at least a year! But when I still had my old job, where I had enough years in to get lots of vacation, I liked to stay-cation in the fall and the spring. I would usually make two lists, one of things I really wanted to do, and one with things I didn’t want to do at all. I tried to pick one thing from each list every day, and when I went back to work, I felt that I had gotten allot of chores done at home and that I had allot of fun, too.